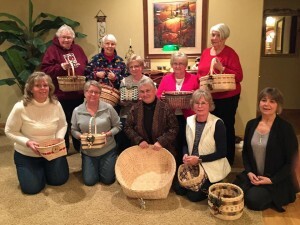 I love hearing about what basket guilds are doing around the country. I often ask my students what their guild is weaving and how they are encouraging creativity. 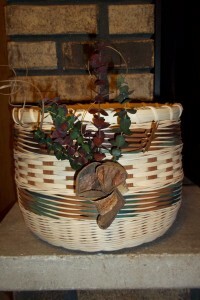 It’s always interesting, basket weavers are so creative! 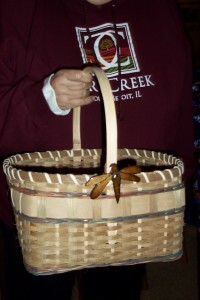 Years ago I heard about the traveling basket project, it sounded like so much fun I asked my local basket guild if they would like to try it. We’ve been doing it every year since. In a nutshell, here’s what we do it – Whoever wants to participate, signs up in January. The organizer takes all the names and makes a plan. 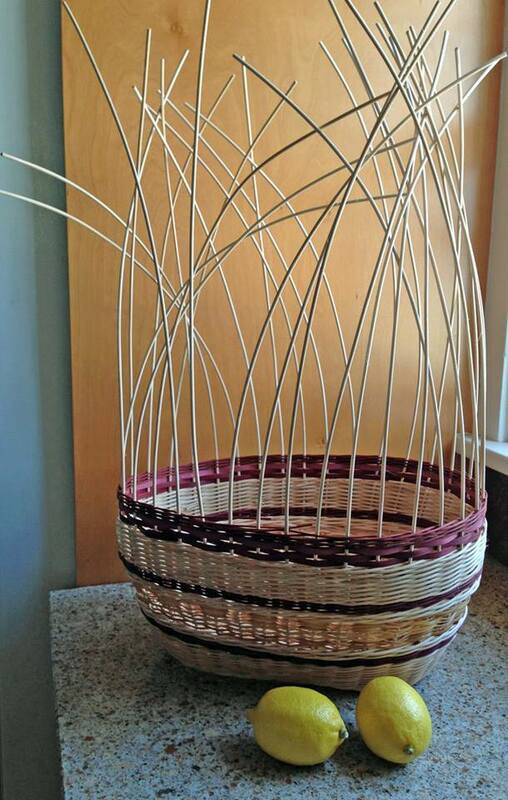 Each basket is worked on by three different people: Person A makes a base, Person B weaves the sides, Person C rims and embellishes the basket. 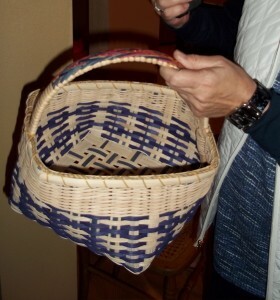 The completed basket returns to Person A at the end of the year. Typically each person has a few months to do each step, with a deadline for when the basket must be passed to the next weaver. All baskets must be completed by December; seeing the completed baskets is always the highlight of our Christmas party! We have had so much fun with this project. The number of participating members varies each year, all depends on who is feeling adventurous! 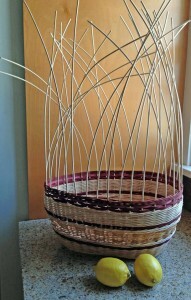 It really stretches your creative juices when you have a base or a partially completed basket sitting on your weaving table for a few months. Many of us have been stumped and thought we wouldn’t pull it off, but every year each basket gets finished. And don’t be fooled into thinking a few months is a long time, when that partial basket is sitting on your table with no instructions it can take a long time to figure out what to do next. You really never know what your base is going to look like when it grows up to be a basket. One of our members has made the same base each year – and every year she gets an amazingly different basket! I’ve included our few rules and suggestions – in case your basket weaving guild wants to try it 🙂 . The base may be round, square or ?? You must weave up at least width of the base. You may add embellishments or a tie on. What a great idea. Will try it for our guild! !